Morning bathers in the Ganges river in Varanasi, India. The Ganges is worshipped as the goddess, Ganga, in Hinduism. Photo by Joel Simpson. HEADS UP: Welcome to the fold new contributor Joel Simpson, a Renaissance man and generally worldly fellow. (Read his profile on the “About VP/[Contributors tab,” http://www.bit.ly/1tzS8VW]) Indeed, he recently returned from a trip to a dozen countries. 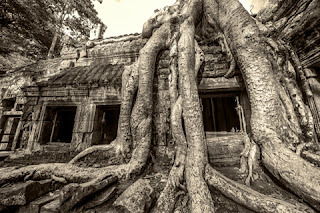 Not only does Joel have breathtaking images to share, which will be published shortly, he returns with some very useful pointers for traveling in the developing world detailed here last week, today and concluding tomorrow. Take heed, Dear Travelers. HAVING returned from a 10-week jaunt around the world, where I visited places I’d heard about all my life, as well as some new ones, I’ve been urging people to convert their envy into their own determination to see the wonders in far-flung parts of our world. Of course, major flights should be booked well in advance. If you’re visiting many countries or going around the world, consider using a flight packager such as London-based Travel Nation (http://www.travelnation.co.uk). Our contact person was Andrea Motta. Travel Nation put our chosen destinations together in a coherent tour, coordinating many different airlines. You can make alterations in the proposal until you get as close as possible to what you want. Take advantage of this option because there are restrictions. If you are traveling around the world, you must keep going in the same direction; there is no doubling back. You'll have to book separately excursions that take you to a city with a small airport or return the way you came. As a rule, do this one to two months in advance of your departure. We found, however, that in certain countries this was not necessary and we booked our internal flights only one or two days in advance, incurring no penalty. We took five excursion flights apart from our round-the-world package. The two I booked in advance I’m sure I saved money on. These were from Varanasi, India to Khajuraho and back. There was also an international flight from Ho Chi Minh City to Siem Reap, Cambodia (the Angkor Wat). These one-hour flights in prop planes were both more than $300. Our internal flights, though, were all booked shortly before departure and were all pretty inexpensive. They were from Ulaan Baator, Mongolia to Dalanzadgad , Mongolia (the city at the doorstep of the Gobi Desert), from Ho Chi Minh City, Vietnam to Hué, and then from Đà Nẵng to Hanoi. 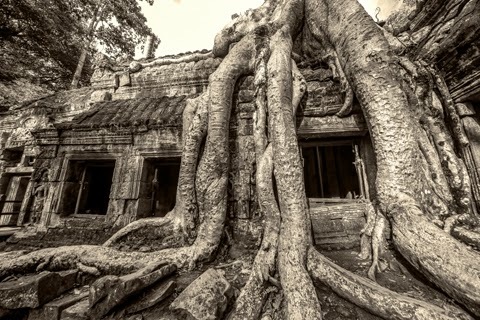 Banyan trees grow all over Cambodia and can be as tall as 100 feet. Photo by Joel Simpson. The Mongolia internal flight was a mere $140 roundtrip. Enktuya Banzrachg, our Gobi Tours (http://www.gobitours.com; [See video above]) tour operator, a perky middle-aged woman who owns the company, practically took us by the hand to the airline office and helped us book our flight.